Now that school is out and summer vacation is in full swing, we know more of you are planning your summer vacation. 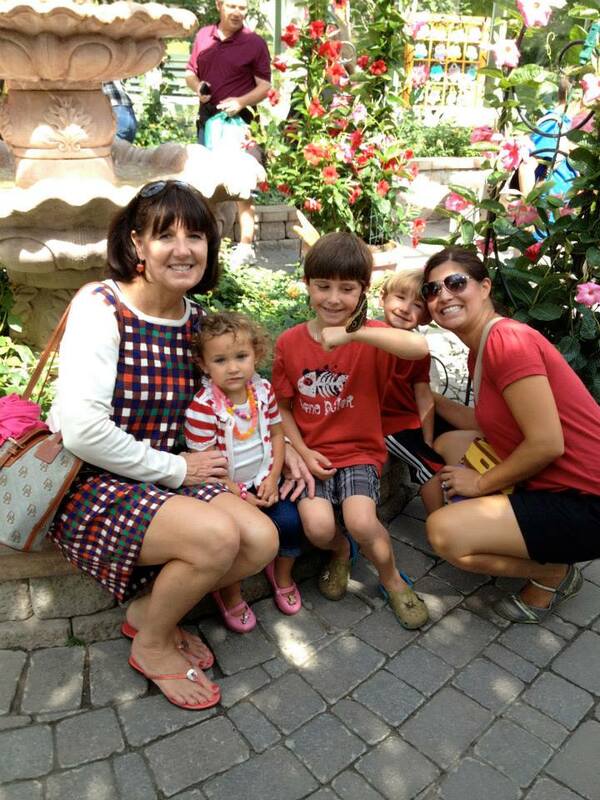 Traveling with kids is a blast, but sometimes it can be hard to find things that the whole family will enjoy. We put together a list of 6 fun things to do on Mackinac Island with kids to help you plan your next Island getaway. Some of them are easy to do and some are a little more adventurous. You choose what fits your family best, and you’ll be the hero of your vacation! 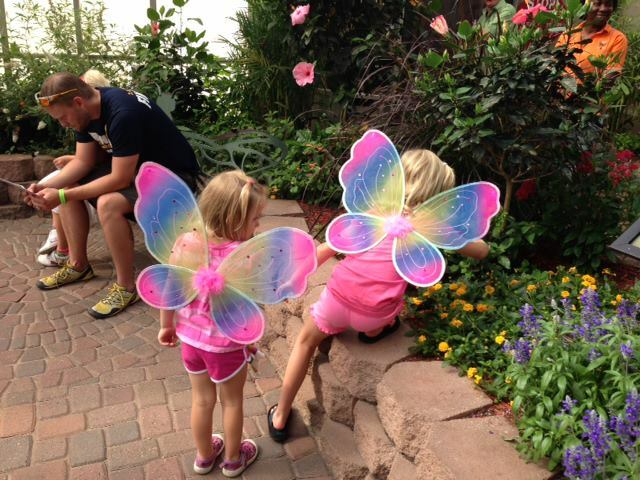 Whether 1 or 101, visitors of all ages love the butterfly conservatories on the Island. Wings of Mackinac and The Original Mackinac Island Butterfly House and Insect World offer kids an escape into the magical world of these beautiful creatures. The Original Mackinac Island Butterfly House and Insect World is the 3rd oldest live butterfly exhibit in the United States! With hundreds of butterflies delivered weekly, you are guaranteed to see several varieties flying about. Your kids can learn about the life cycle of the butterfly, what they eat, and where in the world each species is found. If you visit the Butterfly House, you’ll also see creepy crawly bugs that kids will love. The colorful displays of beetles and insects from around the globe amaze kids and parents alike. Be sure to stop and say hi to Mac, the Red Eared Slider in the turtle park. Every guest receives a butterfly identification chart that you can take home to remind you of the time you spent with the butterflies on Mackinac Island. The Original Mackinac Island Butterfly House is located behind Ste. Anne Church on Main Street. 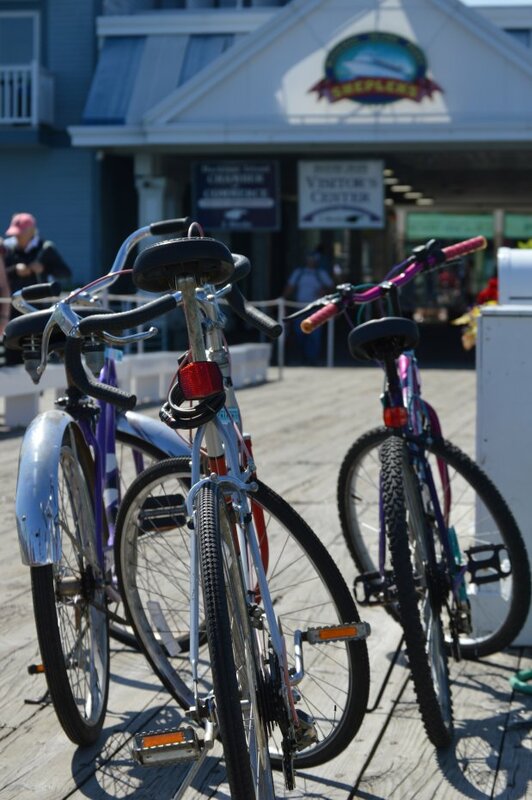 Whether you bring your own bikes or rent from one of the many bicycle rental shops, riding around the Island is always a good time.M-185 circles the Island and is the only highway in the country that does not allow motorized vehicles. This shoreline path keeps you in view of Lake Huron for the full 8.1 miles around. It is a leisurely bike ride that can take as long or as short as you would like and is great for kids. There are plenty of places to stop and take breaks along the way. You can pack your lunch or stop at the Cannonball for their famous fried pickles or a burger and fries. 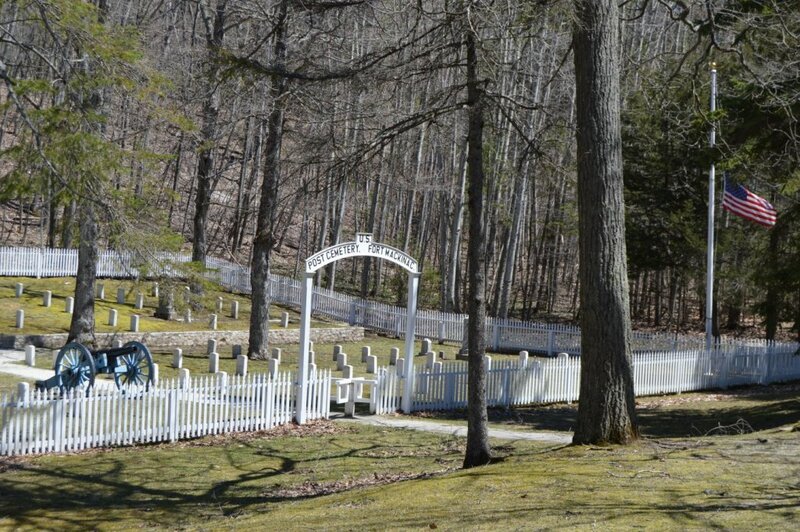 including Post Cemetery where the flag is perpetually at half-staff to honor the unknown soldiers buried there. Venture to the Crack in the Island, a geological formation that is big enough for you to stand in and get a great picture. Go to Point Lookout near Sugar Loaf for one of the most spectacular views of the Island. There are plenty of bike paths that take you to the interior of the Island. Be prepared for a tougher ride, but the benefits are great and the crowds are small. It is in stark contrast with the mostly flat shoreline path. However, there are many great sights to see no matter which path you choose. 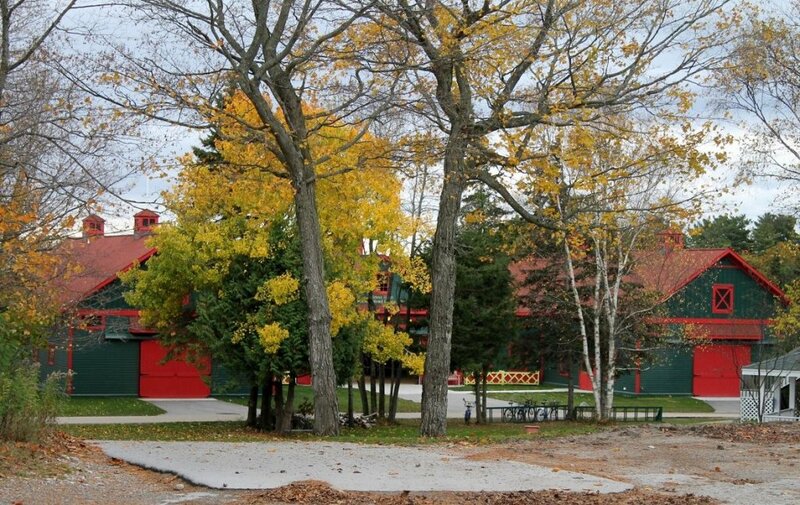 One of the newest additions to Mackinac Island, the Grand Hotel Stables are quite a sight. Originally located next to the Grand Hotel, the stables were closed and built new near Surrey Hill about five years ago. Their green and red paint sets them apart from other stables on the Island. They house 12 horses and 20 antique carriages, some that are still in use on the Island today for special occasions. Admission is free and there are many great photo opportunities for the kids. 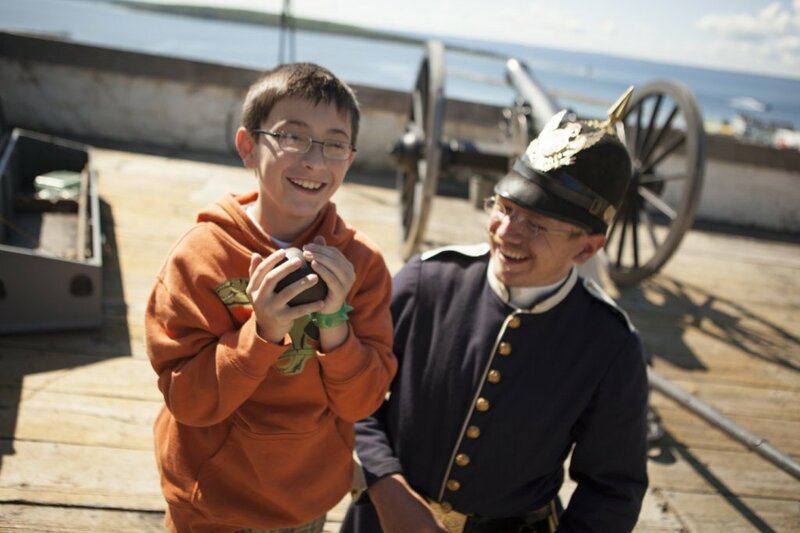 No trip to Mackinac Island is complete without a visit to Fort Mackinac. There is so much to do there that we could focus a series of blogs on just the Fort! There are fourteen buildings to tour with exhibits about life at Fort Mackinac. One of these building is the oldest building in Michigan! Throughout the day there are scheduled demonstrations on the parade grounds, but let’s face it, the kids are going to be most excited about the rifle and cannon firing. The costumed interpreters are amazing at getting children involved and they even will teach them how to march like soldiers of the early 1800s. A visit to the Kids’ Quarters is a must. They can dress up like soldiers and there are a number of hands-on exhibits to keep them entertained. Included with the Fort Mackinac Admission ticket is admittance to the Historic Downtown Buildings. This includes McGulpin House, American Fur Company Store and Dr. Beaumont Museum, Biddle House, and Benjamin Blacksmith Shop. While there are chances to learn about the history of the Island and the Fur Trading industry, there are also demonstrations at the blacksmith shop and interpreters at the American Fur Company Store that will make it fun for the whole family. 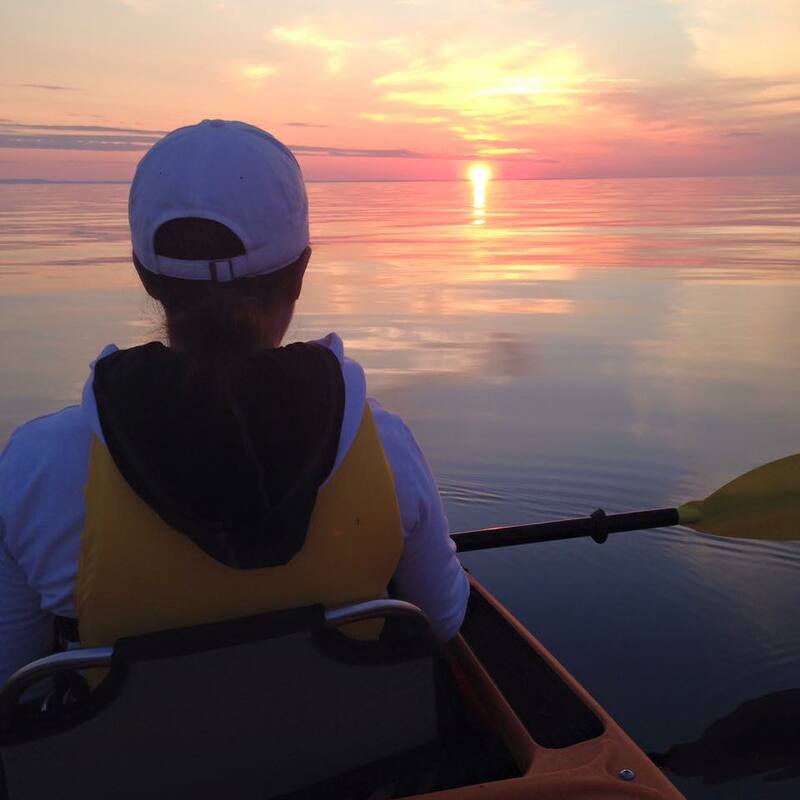 Did you know that you can take a guided a kayak tour of Mackinac Island? From sunrise to sunset and all times in between, Great Turtle Kayak Tours has a tour that is right for you, and they take kids ages 5 and up, offering tandem and single kayaks for the family. Each tour lasts from 30 minutes to 2 hours for beginners. Watch the sunrise from the base of Arch Rock, or if you prefer an evening tour, you can watch the sunset from the footprint of the Grand Hotel. Remember that north of the 45th parallel, sunrise happens around 5:30 a.m. and sunset is around 9:00 p.m. throughout the summer, so plan accordingly. If you are just visiting Mackinac Island for the day, they have a tour that takes you around the Marina and Haldimand Bay. 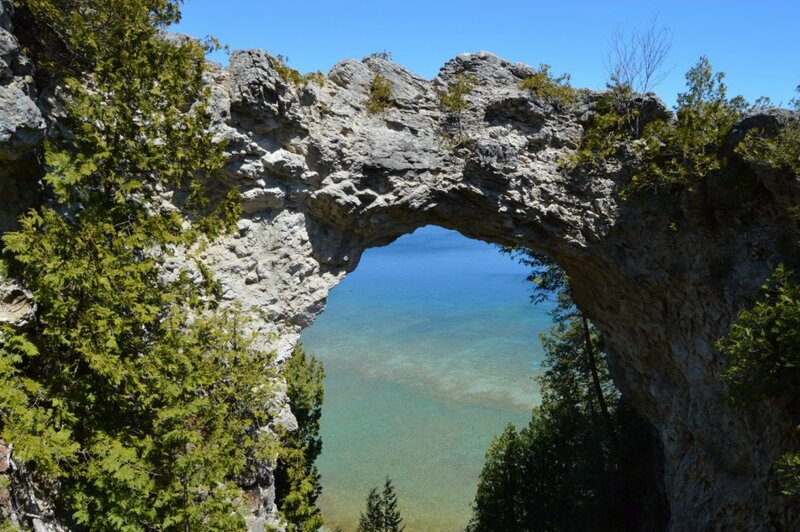 A separate tour takes you to Arch Rock where you can view the Island’s most famous land formation from the pristine waters of Lake Huron. This will be the “it” thing your kids talk about when they remember that summer that you went to Mackinac Island. For more information or to book your tour, go to mackinackayak.com. Want something fun and free to do with the kids? How about trying geocaching on the Island? If you are not familiar with geocaching, it is a treasure hunt of sorts. By using GPS coordinates, you hunt and find caches that are usually small plastic boxes that will either contain a log that you sign when you have found it, or little trinkets to trade. There are over 140 geocaches on the Island! Some are hidden along M-185 (the shoreline road) and some are scattered through the interior of the Island. Hiking to find them may be required. The easiest way to get started is to download the Geocaching app on your smart phone. There you will find the list of caches in the area. The cell service can be a little spotty sometimes, so it might be a good idea to bring a handheld GPS unit. During the hunt, be sure to carry a pen with you to write in each logbook. Also, have the kids bring little things to trade for what’s in the boxes. Just remember this rule – what you put in the box must be of equal or greater value that what you take. So, no trading a rock that you just found for a key chain or a toy. This might be our favorite thing on this list because not a lot of people know about it, and everyone can do it. Make a day of it and combine this with your bike ride! We all hope that you use some of our suggestions to have a great time on the Island. Feel free to share your tips for traveling to the Island with kids in the comments.